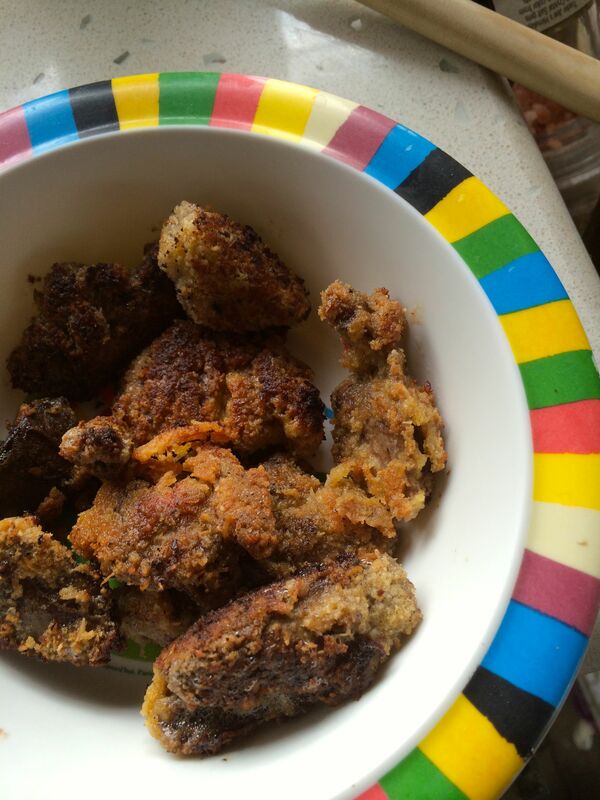 Your coated chicken livers look absolutely gorgeous and I can see your dog hoping longingly for a taste there too! I haven’t heard of oil pulling and it has kind of turned my head upside down for a moment and I will go and have a read about it as it sounds very interesting indeed. Lovely to have a peek in your kitchen! Lulu loves liver, too and she was rewarded for her patience! Oil pulling does sounds a little off the wall – I knew about it for a while before I tried it. Thanks for stopping by! Depending on how much liver I’ve got, I change the amounts but I use 2 parts almond flour to one part coconut. For example: 1 cup almond flour, 1/2 cup coconut, 1 teaspoon salt, 1/2 teaspoon paprika, 1/4 teaspoon garlic powder, 1/4 teaspoon oregano. Trim the liver and cut it up and put it in a bowl then pour a beaten egg over it. Dredge the eggy liver slices one by one in your coating and fry those babies up! Well, that means more liver for you, I guess! (You know, I’ve never made liver pate – I ought to try that out…) Do give the coffee a try – it’s almost crazy how good it is. I am still contemplating the oil pulling. Ten minutes of swishing oil around, first. I’m going to look this up to see the benefits, but I’m interested. I’m glad you liked the looks of the liver — I wasn’t sure about posting that photo! I’m not brave enough yet to dispatch our own birds….yet. Beautiful eggs, there really is nothing better than collecting breakfast of a morning is there? It has been a learning curve for us, but I have really gotten a lot out of it (not just meat and livers!). I do love collecting our own eggs, and we’ve been getting loads of lovely manure out of the coops as well. Add to that the daily bug patrol, and the chickens really are earning their keep. Bring on the chicken livers! When I worked at the bar, there was a small restaurant on my way home. While most would stop there for a hamburger, I placed an order for deep fried chicken livers. I suppose the frying negated a few of the health benefits but I wasn’t eating them for my health. They were just plain tasty! 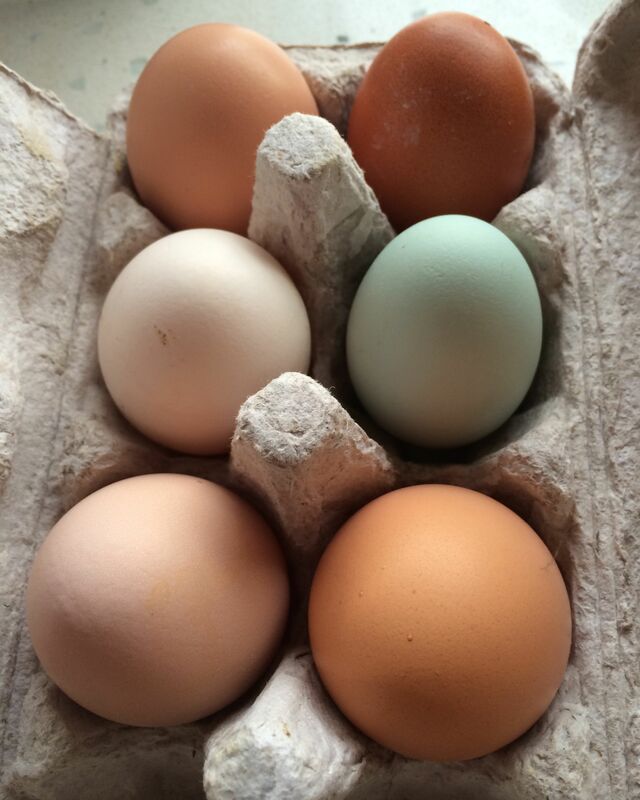 Love the pale blue Ameraucana eggs. I often find a couple intermixed within the dozen I buy at the farmers market. Always a nice surprise. The best thing about eating deep fried food out is not having to make it yourself, am I right? I go out for fried fish because I can’t bear to make it at home. Hi Siobhan, I love your blue egg, it is so pretty. 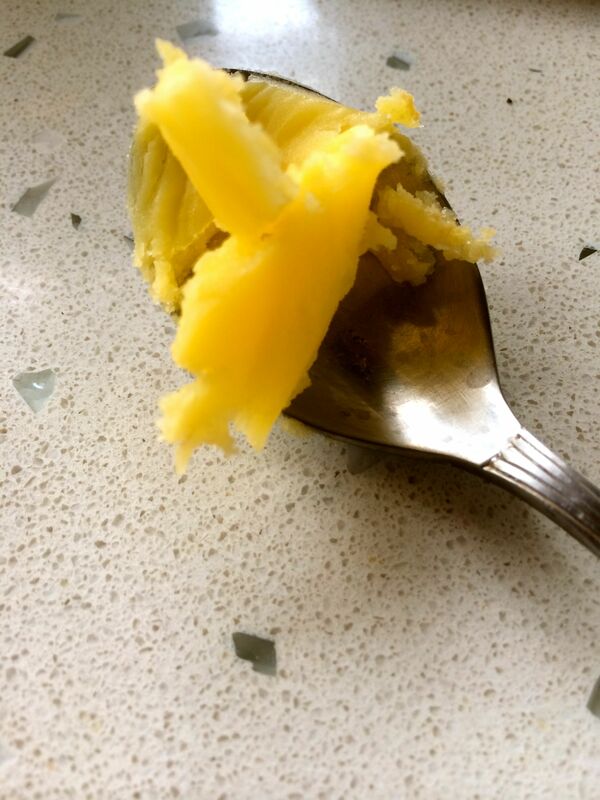 I have never made ghee, I am lazy and buy it but maybe I will take your advice and make my own. If I’m honest, I would probably have bought it if I could but it really is very easy, so that turned out well for me! I cannot eat straight liver but I adore it in pate. I join your love of ghee and coconut oil. Thankfully coconut oil is readily available, so I use it for frying and smoothies. The oil pulling sounds intriguing but I don’t think I could last 10 minutes. 10 minutes does feel long. I try to use it as an object lesson — I do as much kitchen work as I can in that time to show myself how little time it actually takes. G’day Siobhan ! While I am not a fan of chicken livers, your photo made me want to try! LOVE ghee and coconut oil too! Your chicken livers look interesting – normally I just use them in a bolognese sauce or to make a pate but these look much more fun. Just given the oil pulling a go but couldn’t last 10 minutes, ended up with a mouthful of saliva and then got a tickle in my throat and spluttered oil across my computer! Maybe I should try the bulletproof coffee instead. Whoah. Sorry about the oil pulling! Coffee definitely goes down easier! Yes, lovely blue mauve eggs are my favourite too. 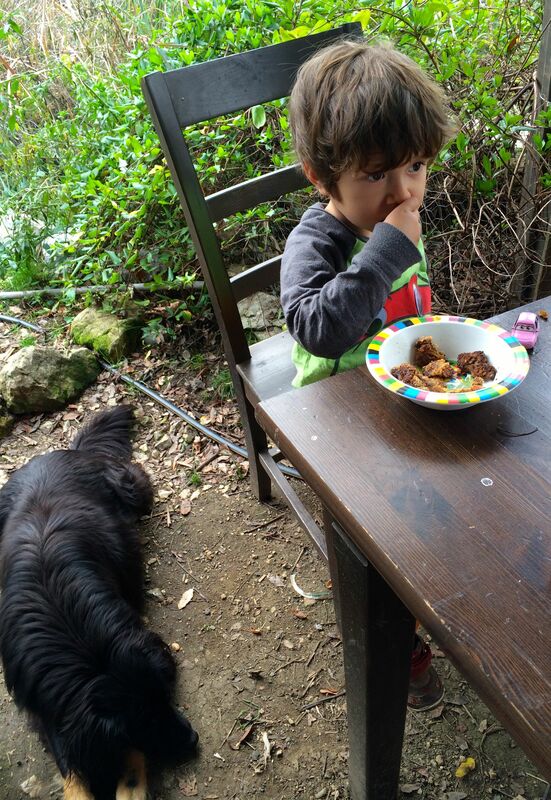 That blue egg is beautiful…and so is a child eating liver! Yes, I can’t decide which sight pleases me more. As for the oil-pulling, I have heard about it, but I don’t know if I could swish anything around in my mouth for 10 minutes. I wonder if the same results would happen if you swished water? But that bulletproof coffee. I am also a black coffee drinker and that is something I could get onboard of. Oh it’s very good and feels like something substantial and decadent at the same time. So, win-win.